Every month the Mataji’s of the temple arrange satsang at various homes and at the temple where they discuss Krishna Katha and read from Bhagavad Gita & Caitanya Caritamrita. They share realisations, perform kirtans and then honour prasadam together. Thereafter some of the Mataji’s sleep over at the temple and perform mangal arti service from waking the Lordships, performing mangala arti, making bhoga offerings, dressing the Deities and shringar arti. These mata ji satsanga’s has brought the devotees closer together in sharing new experiences and helping one another in their sadhana and spiritual life. 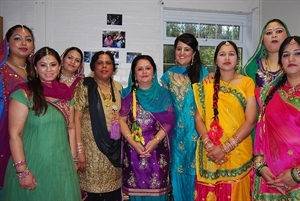 Some of the ladies from the matajis satsang perform at Janamashtami festival.